The fire came to be called the "Jesusita Fire" and eventually burned over 8,700 acres in Santa Barbara county. 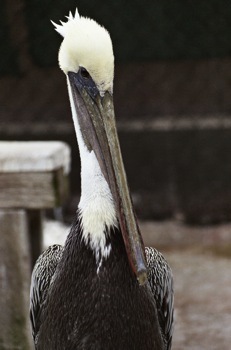 Among the last to receive priority were the helpless wildlife at the local Wildlife Rescue Center, including hundreds of pelicans, egrets, and other seabirds as well as other smaller wild birds who were there recovering from injuries (such as that ubiquitous 'natural' hazard known as fishhooks). We got the first frantic call in the evening and there was no time to spare. We arranged for several large trucks and started the drive to meet people from the wildlife center and transfer the birds who were in most critical need of veterinary support. 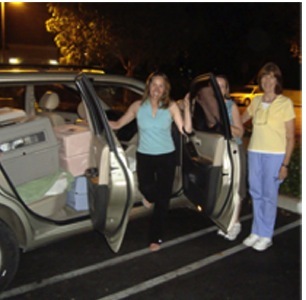 We met them in Ventura, transferred many crates and cages to our trucks, and shuttled them down to waiting veterinary staff and hospitals in Huntington Beach until the wee hours of the morning. By morning, road travel into and out of Santa Barbara was no longer allowed, as the fire was fast reaching the city limits. But the airport was still open, and they estimated we had about two hours before the smoke would make it impossible to fly in or out. So off we went into the wild gray yonder, taking time only to quickly remove all unnecessary seats from the airplane so that we would be able to squeeze in every possible crate and cage full of wildlife. 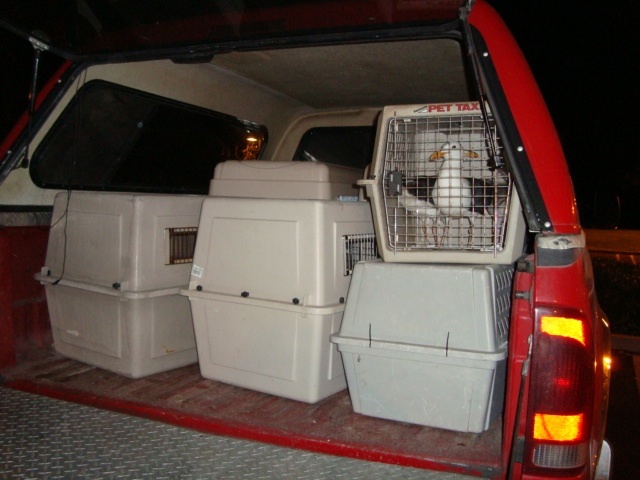 We were met at the Santa Barbara airport by people from the wildlife center, and we filled our faithful plane ("Bessie") to the gills with crates and cages. Even what usually is a seat next to the pilot's seat was filled from floor to ceiling with cages, strapped in so that they couldn't come forward and interfere with the plane's flight controls. We filled the last remaining inches with small cages full of songbirds, and I have never known such a beautiful serenade on a flight-- right through my headsets their songs came. Maybe it calmed us all. When I looked back into the plane, all I saw were big eyes of pelicans huddled together looking back at me. And behind the airplane, smoke filled the air above Santa Barbara. We made it out in the nick of time. Landing at Long Beach, we taxied to an out-of-the-way place where we met the vans and could unload all of the birds without too much publicity. The local news television station found us towar the end of our unloading, though, and they had quite a chuckle at the sight, after they finally believed us that all those cages and crates really had come out of this one airplane! The birds were taken directly to their luxurious new quarters in Huntington Beach to receive the care they needed, and Bessie and I flew back home, no worse for the wear except for some newly-acquired feathers and bird seed.